.... have consistently raised concerns among fixed income investors and regulators. The fear is that the combined effect of the "liquidity mismatch" inherent to ETFs and a potential abrupt reversal of the inflows of the past several years could prove damaging to the secondary market. In February 2013, then Fed Governor Jeremy Stein echoed these concerns, pointing specifically to the growth of corporate bond ETFs: "If investors in these vehicles seek to withdraw at the first sign of trouble, then this demandable equity will have the same fire-sale-generating properties as short-term debt." Stein's concern was proven to be warranted two years later, in August 2015 when a wholesale "glitch" in ETF liquidity caused the infamous flash crash which led to a partial market shutdown, and the VIX going offline for over half an hour. 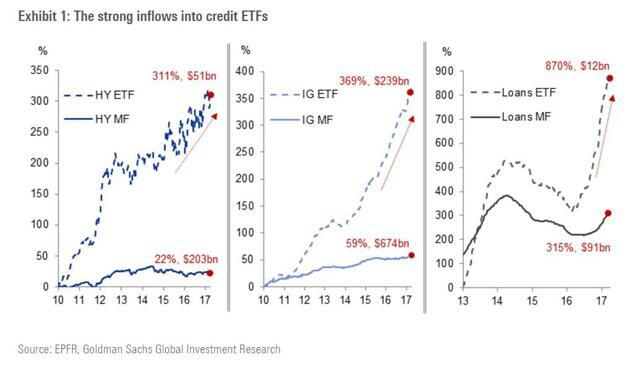 Another frequently encountered narrative, Goldman notes, is that ETF inflows, the process through which new shares are created, exert decent technical pressure on secondary market prices and liquidity. 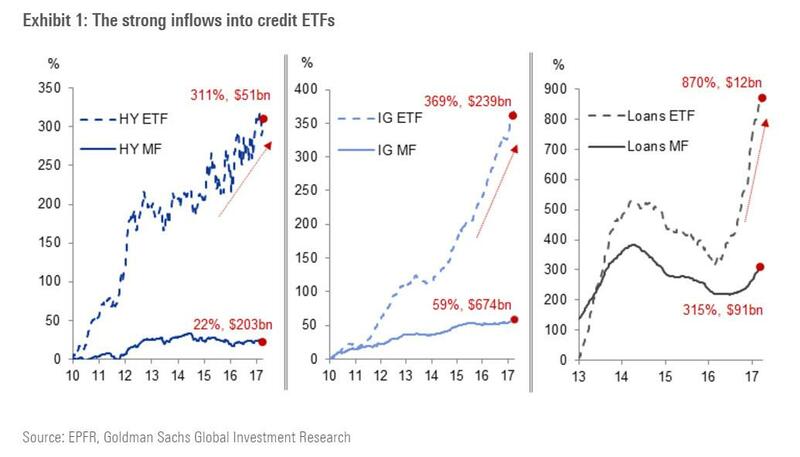 Goldman's conclusion was that while concerns are indeed growing, especially in the area of junk bonds, where there has been a pickup in flow volatility in recent months, for now there is no indication that ETF clustering could result in the kind of dramatic firesales witnessed by the market in the summer of 2015. Perhaps Goldman is right and indeed, so far there have been no major, public dislocations in the ETF creation/redemption process, although it is safe to say that nobody has tested the ETF, and passive investing, paradigm in a world in which global liquidity is declining, as many believe will happen soon. After all, ETFs did not become a dominant market force until after central banks took over the market in 2008/2009. 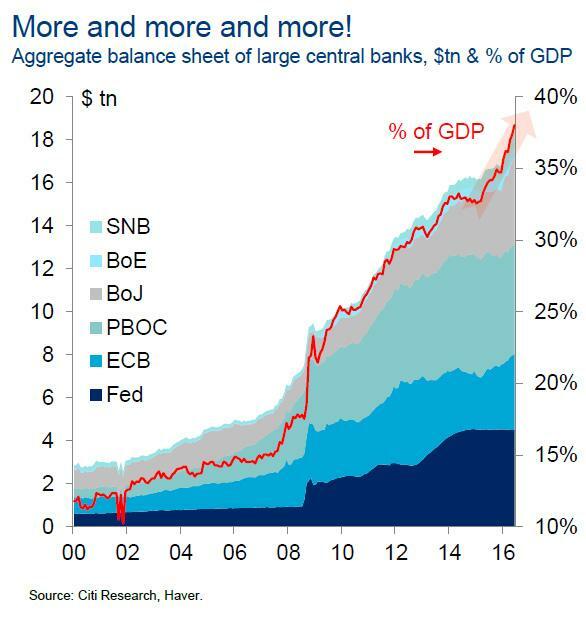 As such, their success may be explained in big part by the liquid generosity of over $18 trillion central bank liquidity. However, while equity and credit ETFs have been relatively blemish-free, at least in the post August 2015 period, commodity funds have seen their share of snafus. 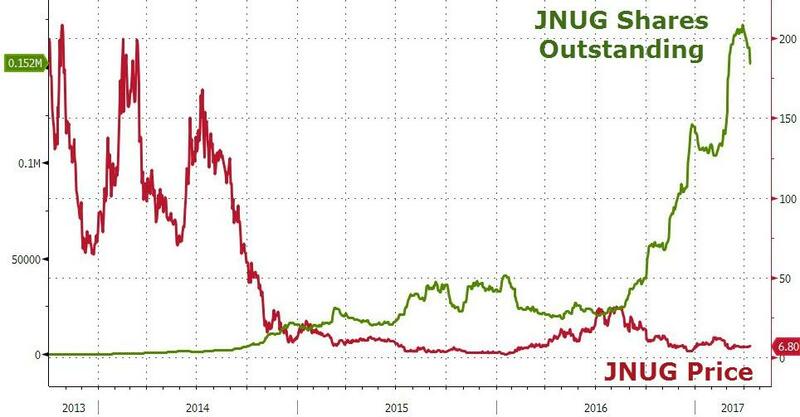 In fact, just this past Thursday, the Direxion levered junior gold miner ETF, the JNUG, announced it was suspending daily creation orders. While details are scarce, according to Direxion, the 3x levered cousin of the GDXJ, announced on Thursday after the close, that "effective immediately, daily creation orders in the Direxion Daily Junior Gold Miners Index Bull 3X Shares leveraged exchange traded fund (TICKER: ) are temporarily suspended until further notice." The stated reason: suspension is due to the limited availability of certain investments or financial instruments used to provide requisite exposure to the MVIS Global Junior Gold Miners Index. Redemption orders for the Fund will not be affected, and will continue to be accepted in the ordinary course of business. As a reminder, ETF shares are created when an "authorized participant" deposits a daily "creation basket" (or cash) with the ETF. An authorized participant is typically a large institutional investor, such as a broker-dealer, that enters into a contract with an ETF to allow it to create or redeem shares directly with the fund. The authorized participant does not receive compensation from the ETF or the ETF sponsor for creating or redeeming ETF shares. Meanwhile, "a creation basket" is a specific list of names and quantities of securities or other assets that may be exchanged for shares of the ETF. The creation basket typically either mirrors the ETF's portfolio or contains a representative sample of the ETF's portfolio. The contents of the creation basket are made publicly available on a daily basis. In return for the creation basket or cash (or both), the ETF issues to the authorized participant a "creation unit," a large block of ETF shares (generally 25,000 to 200,000 shares). The authorized participant can either keep these ETF shares or sell some or all of them on a stock exchange. 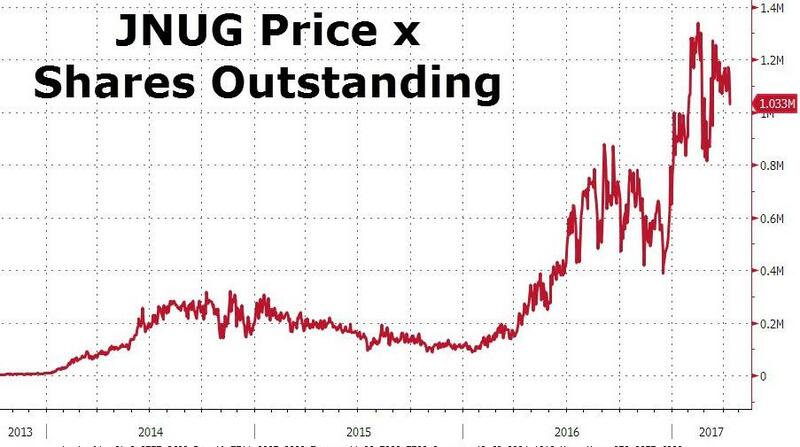 For whatever reason, as of Thursday the above process for JNUG is now halted, and as Direxion notes, "should demand exceed supply during the period that creation units are limited, the fund could trade at a premium to its net asset value (NYSE:NAV). This suspension does not impact the ability of investors to trade shares of the fund on stock exchanges." And while this makes intuitive theoretical sense, what may be really going on here practically? There is no immediate answer. A quick look at this ETF, which like all other highly levered ETFs has a huge theta, and has seen its nominal value collapse over the years, has also seen a dramatic increase in its outstanding shares in recent months, in a repeat of what happened to various levered VIX ETFs one year ago, as investors have rushed to gain the most levered possible exposure to further gold upside. A quick look at the performance of three linked assets in the past week shows additional decouplings: gold (+2.5%), GDX (+4.4%), and GDXJ (-0.03%). One idea voiced by "Tech Strategist" Fred Hickey is that the GDXJ ETF has seen so much demand since the recent gold bull market began 15 months, ago that it has had trouble buying enough Juniors that meet its criteria. Furthermore, GDXJ ownership positions ran up so high in several core names (approaching a 20% threshold) that it could effectively buy no more, going back to the original issue of ETF creation being limited by endogenous liquidity and stock technicals. Hickey further notes that differences around the GDX/GDXJ ratio in the last week were probably due to a rebalancing, but he claims there is "no getting around GDXJ has had shortages of junior miners." For now it is unclear if the JNUG suspended due to an investor stampede into the ETF in the last few days of the week as gold broke out, or there is simply a liquidity constraint. Both may be relevant. Keep an eye on gold, especially as it now approaches a key breakout level. If investors are limited in how they can allocated capital to the yellow metal, it is possible there will be fireworks. And finally, if gold creation is about to surge, does that mean that the Redemption process for all other, non-gold ETFs is about to be impacted as well? 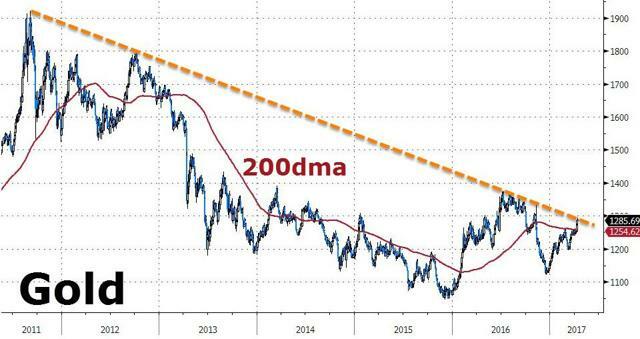 After all, a breakout in gold would imply broad selling of all risk assets. We look forward to the answer, however here, once again, is Fred Hickey, who muses "Imagine the turmoil in the overpriced general stock market when ETF selling begets more selling." Conveniently, we don't even have to imagine - we just have to remember what happened on August 24 of 2015 and magnify it several times for dramatic impact..
Of course the writer is intimating that JNUG can go TO THE MOON ALICE!!! - or into the abyss. Like we didn't know that already? Disclosure: I am/we are long TRUMP.